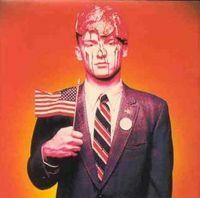 Filth Pig is the sixth studio album by industrial metal band Ministry, released in 1996 on Warner Bros.
Records. The title was allegedly derived from a statement made in the British Houses of Parliament, where bandleader Jourgensen was described as a filthy pig by MP Teddy Taylor. Despite being the band's highest-charting album in the US, it was negatively received by reviewers, sharply divided the band's fanbase, and was a commercial failure. The industrial-tinged sound, prevalent on the group's previous albums, was heavily scaled back here, moving further into a heavy metal sound, even though it included the band's trademark electronically influenced sound.